Rhys plays a solo as part of the Elevate Festival on 23 October 2014. Noveller will be on the same bill. Rhys will play a set starting on Bb trumpet, followed by electric guitar tuned in just intonation, and finishing with C, alto and bass flutes. Rhys Chatham is opening for two bands from Brooklyn: Vaz and Child Abuse. Doors open at 8pm and the concert starts with Rhys playing solo on Bb trumpet, electric guitar, and C, alto and bass flutes. The composer, performer and visual artist, Charlemagne Palestine, is a unique and extravagant voice in the music landscape. Though hailing from New York, he has lived and worked for many years in Brussels. Many know him through his ever-stunning Strumming Music and epic organ pieces. 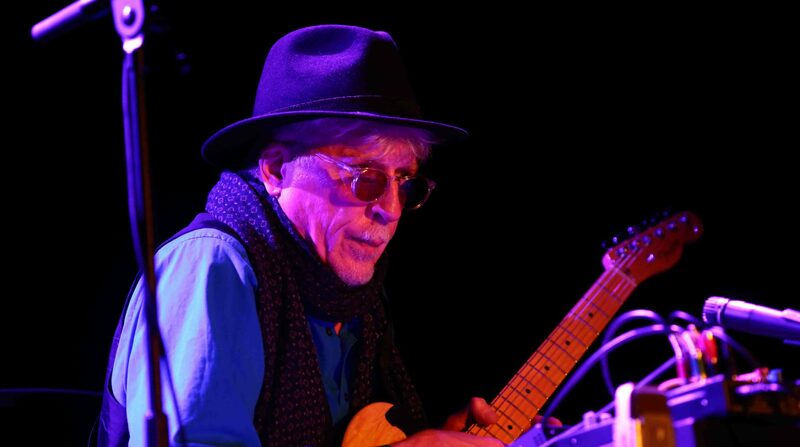 Also from New York, Rhys Chatham, helped to define the rock-DNA in Lower Manhattan in the 70’s. Besides his work as a composer, trumpeter and guitarist, he is now best known for his 100-strong Guitar Orchestra. Palestine and Chatham met in New York in the late 60’s and two years ago they decided, after a 30-year hiatus, to work together again. The results of this collaboration will soon be released as a new CD on the Belgian label Sub Rosa. You should expect a very intense performance with strumming-style piano and stubborn voice experiments, in a meditative dialogue with guitar, trumpet and flute. A unique opportunity to see two giants in contemporary composition on stage together. Solo performance by Rhys Chatham of Le Crépuscule du soir for alto and C flute, followed by piece for justly tuned electric guitar and Bb trumpet. Afterwards, there will be a showing of a film by Blaise Harrison entitled L’Harmonie. A Secret Rose for 100 electric guitars, el. bass and drums will have its UK premier in Birmingham, UK as part of the Frontiers Music Festival on June 7, 2014. The performance will take place at the Birmingham Town Hall at 7pm. Le possédé (2014); for trumpet, alto and bass flute, electric guitar, electronics. The Sacrebleu (2014); for trumpet, flute, electric guitar, electric bass, electronics, drums. Rhys Chatham plays a solo concert: trumpet, flute in C, alto flute, bass flute, electric guitar. Ben Vida opens with a concert of electronic music. From March 2014, Basinski and Art Assembly will co-curate a series of Arcadia inspired music and live art events in London. Composers William Basinski and Rhys Chatham in conversation as part of Arcadia – a series of music and live art events co-curated by William Basinski and Art Assembly in London.Door Times : 7pmTickets : £4 advance / £5 on the door. G3+ SOLO SET ON 23 JANUARY 2014 IN LYON, FRANCE.posted on January 13th, 2014. La Frange Occulte will be presenting G3 by Rhys Chatham at Le Périscope in Lyon, France on Thursday 23 January 2014. Opening will be a set with Rhys on trumpet, flute and el. guitar with the drummer Lucien Chatin.Musicians: Philippe Badey (Guitare), Jean-Pierre Bouchard (Guitare), Rhys Chatham (Guitare), Jon Fayard (Guitare), Thomas Giraud (Guitare), Xavier Lacombe (Guitare), Lagnax 2000 (Guitare), Guillaume Médioni (Guitare), ,Takeshi Yoshimura (Guitare), Carine Di Vita (Bass), Lucien Chatin (Batterie).